18 months ago I wrote about unsupervised classification of randomly extracted point data from satellite data. I have been meaning to follow it up with showing how straightforward it is to use the cluster algorithms in Sklearn to classify Sentinel 2 data. I have made this blog into a Juypter Notebook which is available here. To run an unsupervised classification on satellite data using Python you need GDAL, Numpy and Sklearn. If you wish to see the data you will also need Matplotlib. Assuming you have the libraries installed, import them at the start. Let’s start by looking at a single band of Sentinel 2. In this example I am looking at band 2, which is the blue band and has a spatial resolution of 10m. Sentinel 2 is currently a pair of multispectral satellites with a variety of spatial resolutions. 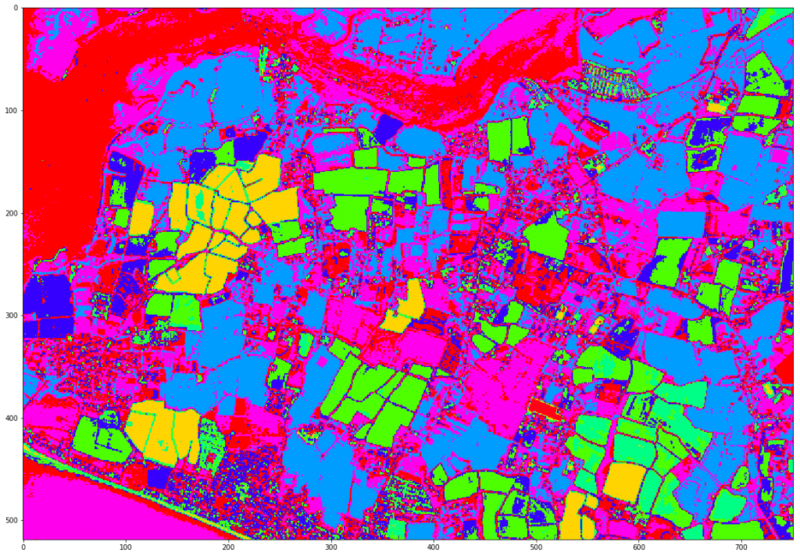 You can find out more about Sentinel 2 here. Now we can run the k-means classifier on our data. First of all we need to choose how many clusters; in this case I am selecting eight classes. Then I am fitting it to my data (X) which we defined above. Finally I am assigning a new variable to the results of this fitting called X_Cluster. After the labels have been assigned I then need to reshape this result back to the dimensions of my original image. The first line is the same as before. The second line is the quickest way of loading a multi-band image into a numpy. This is done by intitalising an array of zeros (or it could be ones with the np,ones command). 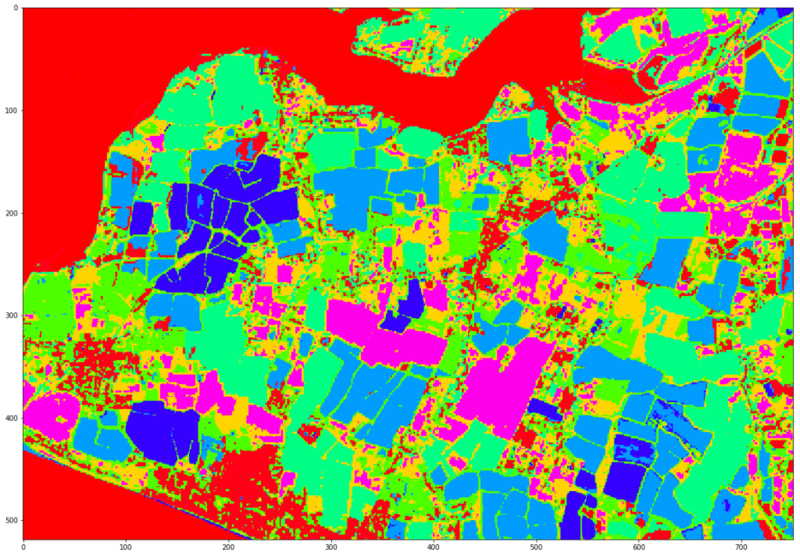 It takes parameters of the RasterYSize, RasterXSize and number of bands of the input satellite image and the data type. You can print these if unsure of the values. This is a much faster implementation of K-Means and has produced a comparable result, though perhaps with a little more noise. Finally let’s save the result as a geotiff. We do this by first opening the input image to get at its properties. We only need a single band as before (band 2). We convert it to an array of data (line 3) and then extract the columns and rows to a list (line 4). Set the output as a geotiff (line 5 and 6). Line 7 creates the output raster with the dimensions of the input raster; lines 8 and 9 set the projection and extent of the data. The last step is to write the classification result to a single band raster image (line 10) before calling FlushCache() to remove from memory and delete the data. That’s it. 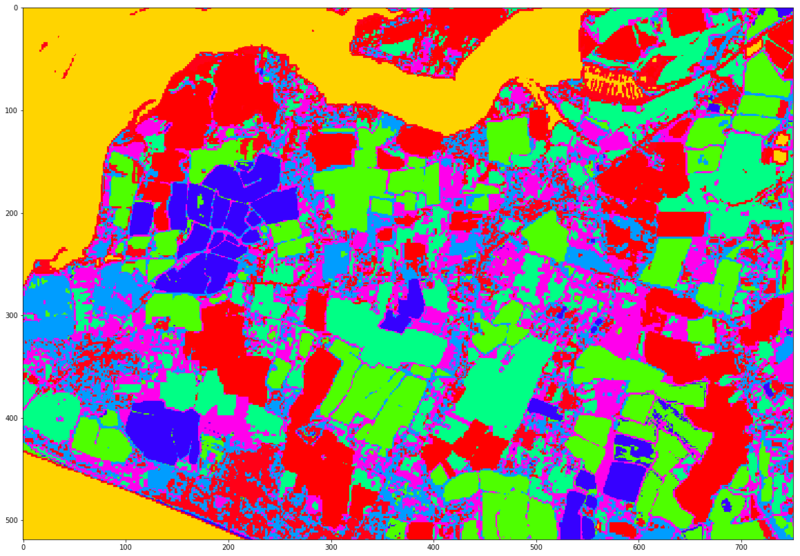 You should be able to load this classification raster into a GIS package now and compare directly with your input satellite image. We have saved the results as a geotiff to use in a GIS package of choice. The code is available here as a jupyter notebook. This code shows how to use an unsupervised classification on satellite data with Python. I teach how to adapt this code to build a supervised classifications on satellite imagery with Python. If you want to find out more please drop me a line or look on my website. This entry was tagged Earth Observation, GDAL, Jupyter Notebooks, python, Sentinel2, unsupervised classification. Bookmark the permalink.